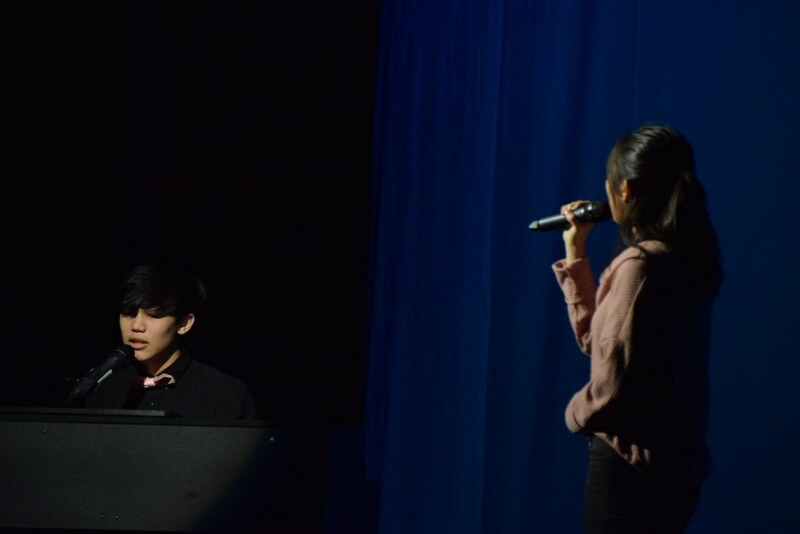 East held its twelfth annual Coffeehouse show Saturday night in the East auditorium to benefit Project Semicolon, a mental health organization. Coffeehouse, planned by East Singers and Thespian Society every year, is home to a myriad of acts. From singing, to dancing, to rubix-cube solving, the night is full of entertainment provided by East’s student body. Hosting the show were self-proclaimed masters of ceremony: East Singer Co-Presidents Cassie Cuddihy (‘19) and Jack Granite (’19) along with Thespian Society President Kevin Naddeo (‘19). After every couple of acts, the three came out and performed a little skit (such as wearing squid hats and making puns or a “nice-off” between Cuddihy and Granite) before introducing the next acts. The show was split into two acts, with a twenty minute intermission between the two. During that intermission, the audience flocked to Cafeteria 1, which was filled with streamers and floating jellyfish. Desserts were on sale for a dollar each, with all of the proceeds from admission along with the bake sale being split between Project Semicolon and Oaks Integrated Care. The East stage was decked out with cardboard cutout waves and student-made jellyfish hanging in the hallways and the cafeteria, all related to the tagline of “just keep swimming” selected for the night. For one act, Beefcake, a pop punk band comprised of Jake Bornyasz (‘19), Nikolas Vasiliadis (‘19) and Benjamin Kornak (‘19), started playing a mashup of “Come Together” and “My Generation.” When they were done, the lights fell on East Singers as they stood on the risers and sang “The Java Jive,” following tradition. While the performers were on stage, the lights were off in the little theatre as players competed in video game tournaments. The causes are chosen by East Singers and Thespian Society through a vote. Naddeo pitched Project Semicolon and later they decided to add Oaks to the show. “Being a student in high school I know that depression and anxiety and mental health affects a lot of students and they feel uncomfortable… but I feel that if we use Coffeehouse’s power and present this cause then maybe people would feel like it’s okay to talk about whatever they’re feeling,” said Naddeo. The theme also resonated with performers, some of whom created their acts around the theme. Through both Project Semicolon and Oaks Integrated Care, Coffeehouse 2019 hopes to reach people both nationally and nearby, with Project Semicolon being a national organization and Oaks being a facility in Cherry Hill.